← Lost (And Added) in Translation? 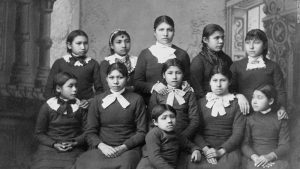 Native American boarding school students. For anyone with children (or really, anyone at all) the news about Central American immigrant kids being separated from their parents is heart-rending. But that’s not to say that American history is free of numerous other similar examples. Get some historical perspective in this piece by CNN: Actually, the US Has a Long History of Separating Families. The story is a brief reminder that African-American slaves, native people, Mexican immigrants in the 1930s and Japanese-Americans during World War II all experienced family separation.